Historiadores británicos dijeron que han descubierto nuevas pruebas geológicas para resolver uno de los mayores misterios de la antigua Grecia: precisar dónde se encuentra la antigua isla de Ítaca, hogar del legendario héroe de Homero, Odiseo. "Estamos a un paso de descubrir el antiguo misterio", dijo el asesor Robert Bittlestone, quien ha trabajado con profesores de historia clásica y geología para unir las piezas del intrigante rompecabezas arqueológico. Encontrar Ítaca podría rivalizar con el descubrimiento de la antigua Troya en las costas turcas en la década de 1870. Nadie sabe si Odiseo o su ciudad existieron realmente. Pero el descubrimiento de las ruinas de Troya, donde Odiseo y otros héroes legendarios griegos batallaron, llevó a los estudiosos a creer que la historia de Homero es más que una leyenda. Hasta ahora, se pensaba que el reino de Ítaca estaba en la isla jónica de Ithaki. Pero el equipo de Bittlestone dijo que cree que está en Paliki, una península en la isla de Kefalonia, al oeste de Ithaki. Bittlestone, que quedó intrigado por el misterio mientras estaba de vacaciones en Grecia, consiguió la ayuda del clasicista de Cambridge James Diggle y el geólogo de Edimburgo John Underhill para perforar un pozo de 122 metros en la franja que une Paliki con el resto de Kefalonia. No encontraron roca caliza sólida, lo que sugirió que Paliki podría haber sido una isla por sí sola. El equipo dice que las avalanchas y los deslizamientos de tierra causados por terremotos podrían haber llenado un antiguo canal marítimo. Bittlestone aseguró que se harán más pruebas a lo largo del istmo para probar su teoría. "Existen evidencias de que estamos tras la pista correcta", afirmó. "Durante miles de años la gente pensó que Homero estaba equivocado en la descripción de Ítaca. Creo que Homero estaba en lo cierto pero no lo vimos porque el paisaje ha cambiado", agregó. Experts using seismic tools and the poet's words say they've found the island of Ithaca. Using boreholes and seismic imaging to analyze subsurface geological features, British researchers have provided a key confirmation of their claim that Ithaca, the home of the legendary Greek warrior Odysseus, was located on a present-day peninsula of the island of Cephalonia. The jutting piece of land, the scientists say, was a small island separate from Cephalonia until rubble from landslides and earthquakes over the centuries filled the channel between them. The researchers think the peninsula, called Paliki, was the residence of the hero of the epic poem "The Odyssey," which along with "The Iliad," in which Odysseus also appears, is said to have been written by Homer in the 8th or 7th century BC. The findings support earlier studies by the trio of researchers that linked specific sites on the peninsula to locations mentioned in Homer's verses. A borehole drilled through the suspected site of the channel and underwater imaging of nearby bays have revealed rubble and marine fossils consistent with the researchers' theory, said John Underhill, a geologist at the University of Edinburgh. "This is a prima facie indication that we were right that there was a channel there, subsequently filled by infall and seismic disturbances," he said. The results do not yet prove that Paliki was the home of Odysseus, said team leader Robert Bittlestone, chairman of the management consulting firm Metapraxis and a classics scholar and amateur archeologist. "But that is the simplest solution that meets the observable facts." Classics scholar James Holoka of Eastern Michigan University, who was not connected with the research, said he found the argument "very compelling." "What's amazing to me is how fast this is all happening," he said. Bittlestone "went on a vacation [to Paliki] in 2003, published a book in 2005 and now has mobilized all these scientists and technological advances and is placing the results on the Internet. This is digital age archeology." Many classicists argue that Ithaca, where Odysseus returned after the Trojan War ended about the 12th century BC, was an imaginary place. But scholars also said that about Troy before the city's remains were found on the northwestern coast of Turkey in 1870. Other scholars place Ithaca on the modern island of Ithaki, and expeditions have searched that island fruitlessly for archeological confirmation. But Ithaki lies east of the 288-square-mile Cephalonia, whereas Homer stated precisely that Ithaca was the westernmost island in the group. Using Homer as a guide, Bittlestone and colleagues Underhill and classicist James Diggle of the University of Cambridge concluded in their 2005 book "Odysseus Unbound" that the Paliki peninsula could have been Ithaca if it once was an island. Their entire argument depended on the onetime existence of a channel separating Paliki from mainland Cephalonia. Last year, Underhill and a team from the Greek Institute of Geology and Mineral Exploration in Athens did a seismic survey that showed deep sub-surface features leading up to the presumed channel, indicating that water once flowed through what is now an isthmus. In October, the team drilled a 400-foot borehole near the southern end of the postulated channel. The drill encountered only loose rubble until it struck solid limestone about 45 feet below the current sea level. Because earthquakes have raised the entire island, that limestone floor would have been about 60 feet below sea level in Odysseus' time, the researchers said. The final proof of the theory, Holoka said, "would be to come upon certifiably Bronze Age or Mycenaean Age remains on Paliki. That would be the clincher." Paliki is a peninsula of the island of Kefalonia (Cephalonia), in the Ionian islands of western Greece, at 38°18′39.72″N, 20°25′6.75″E. Paliki has sometimes been identified as the ancient location of Ithaca, the homeland of Odysseus, as described the Homeric epic, the Odyssey. This identification dates back to at least 1903, when Gerasimos Volterras published his A Critical Study of Homeric Ithaca, but a recent book by Robert Bittlestone, Odysseus Unbound,1 uses the evidence of modern geology to make a case for identifying Paliki as Homeric Ithaca. This article is based on Bittlestone's identification. The initial insight leading to the discovery came from a tourist roadmap of the Paliki area, which Bittlestone purchased following a visit to the region, in preparation for another visit -- one this time to the modern island known as "Ithaki". Scholars for centuries have noticed that the island of Ithaki does not correspond to the detailed descriptions of the home of Odysseus offered by Homer in the Odyssey. Many explanations, from "poetic license" to ingenious geographic routes, have been used to account for the discrepancies. Bittlestone had noticed, however, that the western peninsula of Kefalonia appeared to correspond with the principal clues offered by Homer, yet it is not an island. On his previous trip, though, his daughter's question, about an inland hilltop fortress on neighboring Lefkas island -- "But why did they build it here?" -- had led to the thought that sea levels in the area might once have been much higher, that in turn leading to the idea that higher sea levels might once have cut off the Paliki peninsula from its mainland, Kefalonia, making Paliki an island. The tourist map seemed to confirm this: on it, Bittlestone saw, the neck of land connecting Paliki to Kefalonia did appear to be very narrow and, more importantly in this mountainous region, relatively low along most of its length. Confirmation was needed from at least two sources: philology -- to ensure that the Homeric account of "Ithaca", which has come down through so many different translations over so many centuries, was properly understood -- and geology, to establish among other points that the narrow neck of land on Kefalonia could in fact have been the site of a sea channel, in the times of Homer and of Odysseus. James Diggle, a co-author of Odysseus Unbound (particularly Appendix 1), is Professor of Greek and Latin at Cambridge University. His detailed analysis of the description of Ithaca and the surrounding islands found both in Homer and in Strabo and other texts was crucial to authenticating the Paliki discovery. -- and similar lists were made for "Odysseus' Palace" (Figure 17.2, p. 194), "Doulichion" (Figure 21.12, p. 270), and other locations. Clue 1 -- Does Ithaca lie low and to the west, the furthest out to sea of a group of neighboring islands, called Ithaca, Samos island, Doulichion and Zakynthos? Clue 2 -- Does Ithaca contain a bay with two distinctive jutting headlands? Clue 3 -- Can a ship leave Ithaca harbor driven by a stiff following wind from the west? Clue 4 -- Is there a two-harbored island called Asteris in the straits between Ithaca and Samos island, with windy heights that would enable an ambush to take place? John Underhill, a co-author of Odysseus Unbound (particularly Appendix 2), is Professor of Stratigraphy at the University of Edinburgh and a recognized authority on the structure and stratigraphy of sedimentary basins, and on the geology of the Ionian islands. His contributions in several areas, including investigation of the prior existence of "Strabo's Channel", and analyses of factors such as tectonic uplift, and erosion, also were crucial in authenticating Paliki. The initial geological problem posed by Bittlestone -- whether sea levels in the region might once have been higher, such that the narrow isthmus now connecting Paliki to the rest of Kefalonia might once have been submerged -- turned out to be exactly the opposite, the sea didn't fall but the land rose, and the periodic earthquakes that triggered this upthrust simultaneously brought down catastrophic rockfalls. Paliki sits on the edge of the European continental shelf, which is being pushed continuously from the southwest by the African plate, in a plate tectonics shift which causes constant earthquakes: the Ionian islands were devastated by one such earthquake as recently as 1953, and there have been many before that. Observation of many geologic clues in the region shows that uplift -- the result of earthquakes -- has in fact occurred. The insufficiency of the uplift to account for the altitude of some of the terrain now at the channel site is explained by high volume "landslips" similar to those that impacted northern Pakistan in 2005: earth and rocks and whole sections of the mountainside itself falling from the high Kefalonia mountains which line the eastern edge of the isthmus, down onto what once had been "Strabo's channel". Findings of ancient Greek structures now buried beneath this erosion provided part of the confirmation for the proposal, which now is to be subjected to a battery of geological tests. 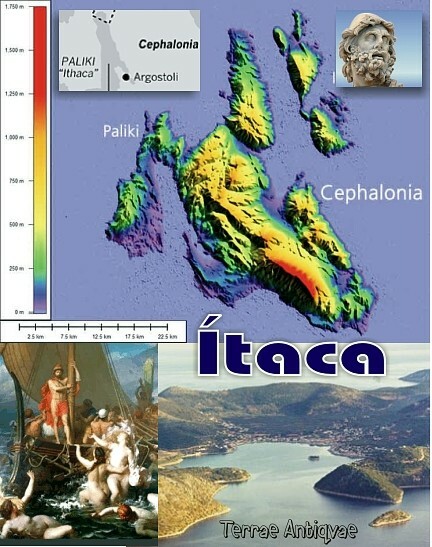 Much of the challenge, in the identification of Paliki as having been Homer's Ithaca, depended upon such a combination of geological investigation with philological analysis. So, passages in Homer indicate that the Ithacan ship which, having eluded the suitors' ambush, dropped Telemachus ashore, then proceeded to a bay framed by two peninsulas: most of this was a matter of geography -- examining maps and visiting local sites and to figure out where, close to a chosen "Ithaca", the "suitor's ambush" point might have been, where the "dropoff point" and "Eumaeous' farm" beyond it, and where the "bay" -- primarily matters of establishing sailing and rowing speeds, and prevailing winds, and studying maps. Then, however, per the ancient texts the ship sailed north from the bay, was able to catch a wind blowing east, and then headed around to land -- without Telemachus aboard -- at Ithaca harbor. The primary problem in the case of the Paliki site was that there appeared to be no channel: connected to the much larger Cephalonia island by its isthmus, a Paliki route from the "bay" to "Ithaca harbor" would have taken the ship days of hard rowing and sailing, to encircle Cephalonia entirely. Yet there was Strabo's 2d c. BC account, of his "Strabo's channel" which supposedly separated Paliki and Cephalonia -- an idea discounted for centuries as having been simply an inaccuracy, in one of the Western world's earliest "geographies". So the first step in the investigation procedure was a matter primarily of philology: translating Homer, and Strabo, in the contexts of what is known now of word-usage in their times, to be as certain as possible of intended meanings. Were there really "two peninsulas", did the boat really sail north and capture a wind blowing east and land soon after at the harbor, and so on. The second step was for geology, required to analyze the soils and structures and history of the Paliki - Cephalonia isthmus, to determine whether and how it might ever have been below water, enough, to have been a "channel". Until Alfred Wegener's theory of plate tectonics was announced2 and accepted3, the idea that the earthquakes to which the Greek region historically has been subjected might be capable of geologically "lifting" entire islands, and even archipelagos such as Paliki and its neighbors represent, was unthinkable and even considered sacrilegious. So Strabo was considered simply inaccurate, for there was no geologically-respectable explanation for the difference between his ancient observation and what anyone contemporary easily could observe. The third step, then, in establishing the existence of "Strabo's channel" on Paliki -- and thus the homeward route of Telemachus' ship as described in the Odyssey -- also was in the province of geology, specifically the fields of stratigraphy and sedimentation and erosion. The isthmus turned out to be low-lying, but not enough that its height might be accounted for entirely by geologic uplift. The remainder of the current height, however, as analyzed and explained and illustrated in detail by Professor Underhill in the study 4, is accounted for by rockfalls and landslides from the neighboring high and steep-sided hills of Cephalonia, over many centuries of regular and massive earthquakes. The finding by the team of Mycenean stonework on the isthmus beach, now deeply buried by such geologic movement, confirmed Underhill's findings. In this instance a three-step methodology was used, then: the first a matter primarily of philology, the second and third more matters of geology. One of the great mysteries of Homeric scholarship, too, has been how Homer -- whoever he was, or whoever "they" were (see Gregory Nagy's book in Bibliography, below) -- living in the Aegean in what now is western Turkey, where he/they are said to have lived, might have acquired such detailed knowledge of "Ithaca" / Paliki as appears in his Odyssey. The suggestion made in Odysseus Unbound (Chapter 26 "Exodus", p. 342ff, particularly Figure 26.1 at p. 343) is that folk-tales of the "Ithacans" containing detailed references to the landscape were carried by them, during their Greek Dark Ages migrations (see Snodgrass below) during the time-of-troubles which followed the Mycenean / Trojan war period, to the Greek mainland and from there to western Anatolia. At that final resting place for the migration of the Ionians, then, roving bards of the type described by Milman Parry picked up the "Ithacan" tales, perhaps, and wove them together into the Odyssey: for the entertainment and edification of audiences who knew Paliki well, and initially were very homesick, and longed for it. 2.- Wegener, Alfred (1915). Die Entstehung der Kontinente und Ozeane, Braunschweig: Vieweg. ; (1966) The Origin of Continents and Oceans, New York: Dover. ISBN 0486617084. Translated from the 4th rev. German ed. by John Biram. 3.- Wegener's plate tectonics theory still was not accepted in some school geology programs until the late 1960s. Ahl, Frederick, and Hanna M. Roisman (1996). The Odyssey re-formed, Ithaca, N.Y.: Cornell University Press. ISBN 0801432219, ISBN 0801483352. Bowra, Cecil Maurice (1964 [c1952]). Heroic poetry, London: Macmillan. Finley, Moses I.. The world of Odysseus, New York: New York Review of Books. ISBN 1590170172. introduction by Bernard Knox; Series : New York Review Books classics. Nagy, Gregory (1996). Homeric questions, Austin: University of Texas Press. ISBN 0292755619, ISBN 0292755627. Snodgrass, Anthony M. (c2000). The dark age of Greece : an archaeological survey of the eleventh to the eighth centuries BC, New York: Routledge. ISBN 0415936357 (hb) ISBN 0415936365 (pb). Stanford, William Bedell (1968 [c1963]). The Ulysses theme; a study in the adaptability of a traditional hero, New York: Barnes & Noble. Wood, Michael (1998). In Search of the Trojan War, Berkeley, California: University of California Press. ISBN 0520215990. Wood, Michael. (1986). "In search of the Trojan War [videorecording] [6 videocassettes (VHS) (50 min. each) : sd., col. ; 1/2 in.]." Manchester, England:British Broadcasting Corporation. Preciosa noticia. Solo espero llegar a ver el dia en que encuentren nuestro Tartessos. Cuantas gracias hemos de dar a Homero y a aquellos griegos por la civilizaciOn tan maravillosa que nos han transmitido. Decian los helenos que "los hombres eran dioses mortales y los dioses, hombres inmortales". A lo que habrIa que annadir que por ello en las civilizaciones inmortales es donde nacieron los dioses.